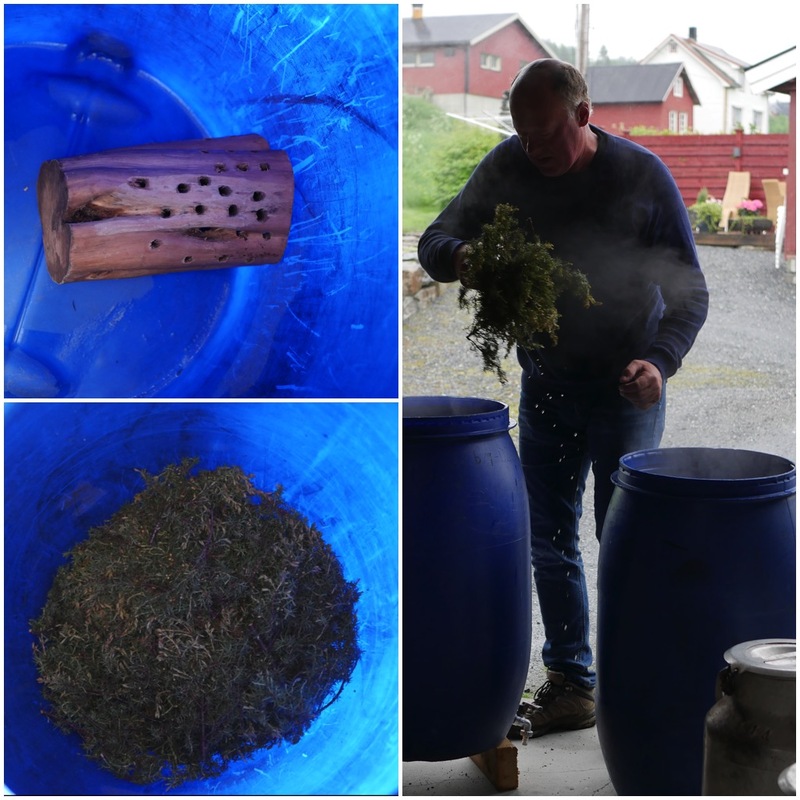 In June 2017 I participated in a traditional brewing session in Hornindal, Norway. We brewed a Norwegian farmhouse ale, or maltøl, typical for the Hornindal area. It was a raw ale fermented with a heirloom house yeast kveik. This is a long story, but the beauty of this tradition is in the details. Hornindal is a small countryside municipality in Western Norway. The road there was winding and fragmented with immensely beautiful mountains, waterfalls and fjords. Obviously the geography has helped to preserve these brewing traditions. The brewing team consisted of four jolly Hornindal men Idar, Stig, Lars and Arve. They all brew maltøl in the similar local style, but each brewer makes own decisions here and there, which makes everybody’s ale slightly different. In this session the brewer making the decisions was Stig Seljeset, who learned the craft from his father, who in turn was taught by his father. The brewing session took place in two outbuildings. 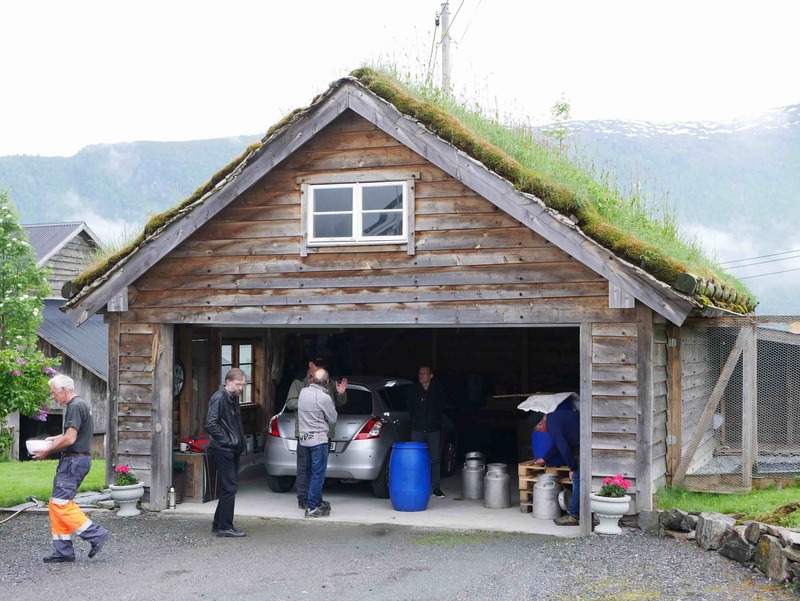 The brewhouse was assembled into this turf-roofed garage. Adjoining traditional timber house had a fireplace for heating water and a cellar for storing ales. Arve Raftevold, one of the brewers, made a four-minute video from the brewing session. Lars Garshol has documented a similar brewing session with different brewer in his article Brewing Raw Ale in Hornindal, which nicely brings out the similar traits as well as brewer-specific differences. If you wonder how maltøl relates to sahti and other Nordic farmhouse ales, I recommend reading Sahti and Related Ancient Farmhouse Ales. For the sceneries, see my video from Geiranger, on our way to Hornindal. The following recipe is for around 70 liters of maltøl. During the brew day the Stig always tastes the wort several times, and the final volume can be few liters less or more, depending on the taste. 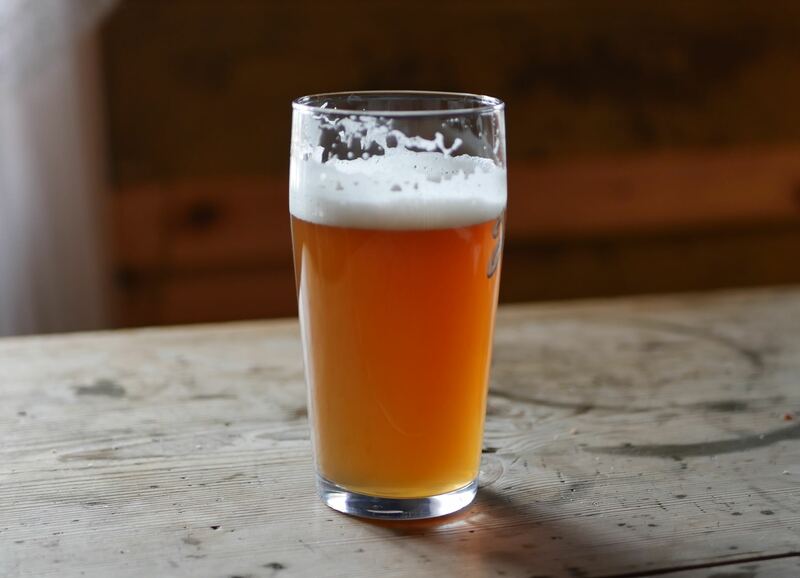 These brewers generally use commercial malts and hops, and they are very relaxed in malt and hop varieties they use. In this session the malt was German Pilsner and the hops were East Kent Goldings (5 % AA), but they talked about brewing with pale ale malts and I saw a packet of Simcoe hops laying around. 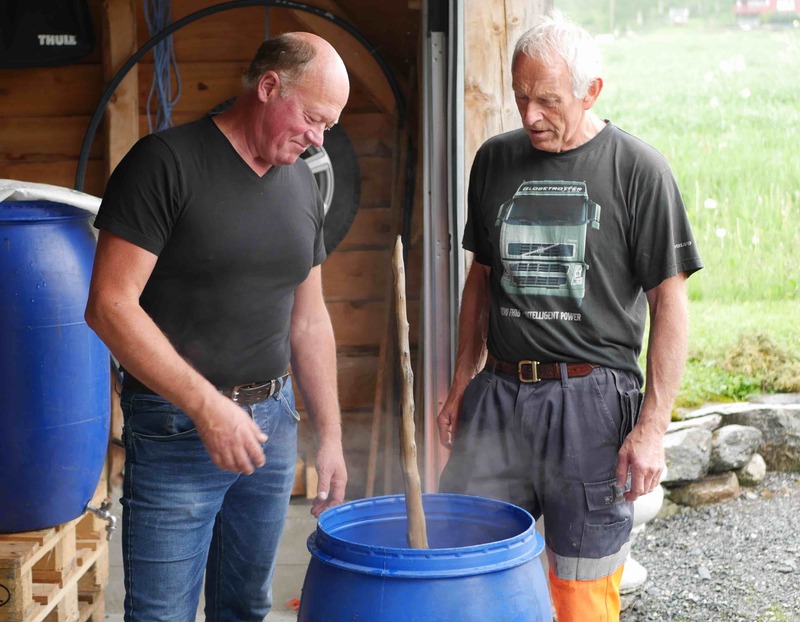 Nevertheless, the ale will be instantly recognizable Hornindal’s maltøl, because much of the character comes from the process and kveik fermentation. The brew day started with infusing juniper branches in a hot water in a wood-fire heated cauldron. These men usually boil the infusion for ten to thirty minutes, and then allow the branches infuse at least half an hour, so that the total infusion time is around one hour. Stig made two batches of juniper infusion. The first was used for cleaning brewing gear, and the second made up all the brew water. The Hornindal style maltøl is a raw ale without a wort boiling step. 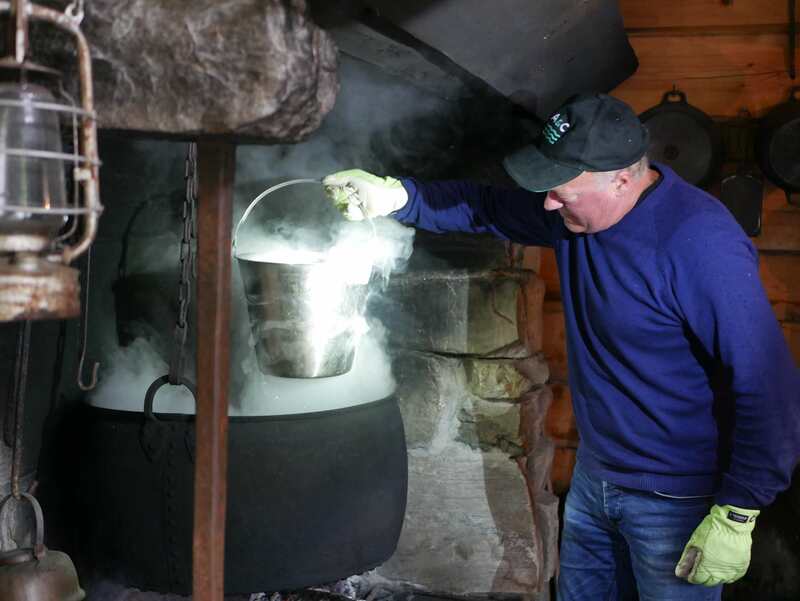 Therefore, the men stressed the importance of cleaning, and they rinsed mashing and lautering vats with hot juniper water just before the brew. The previous evening I had tasted few maltøls from these men, and the juniper flavor was noticeable but delicate. Hence, I was a bit surprised to hear that all brew water was going to be juniper infusion. Of course, the juniper flavor depends on the amount of juniper, and as a general rule, these brewers use 5–6 smaller branches or one medium-sized, as shown in the photo below. The infusion looked amber-colored and it adds some color to the ale. This one juniper branch made around 100 liters of infusion. The amount of juniper was just eyeballed, not measured. The brewing setup consisted of three same kind of plastic barrels. One barrel was used for mashing, the second for lautering and the third for fermenting. This was Stig’s 70th brew with this setup, during the last fifteen years. Stig doesn’t use a thermometer for mashing, and instead he employed a trick I have seen before in a Estonian farmhouse brewery: bring the brew water to boil, let it cool down slightly before mashing. With this method every modern brewer would be worried about hitting correct mash temperature, but Stig seemed to be very casual about it. Nevertheless, I’m pretty sure that he is consistent with the temperatures, as experienced farmhouse brewers often are. 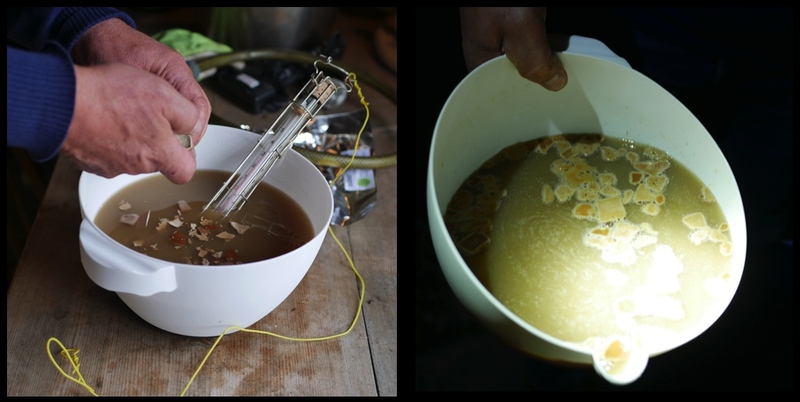 I had a thermometer, and the mash water (juniper infusion) measured 76–77°C which gave a mash of around 70°C. Since we were brewing a raw ale with a single temperature mash, this was about the highest temperature for the mash and wort. While waiting for the brew water to cool, Stig prepared the lauter tun filter, as shown in the photo series below. The juniper braches used for the filter were first steeped in hot water, which was somewhat unusual step. 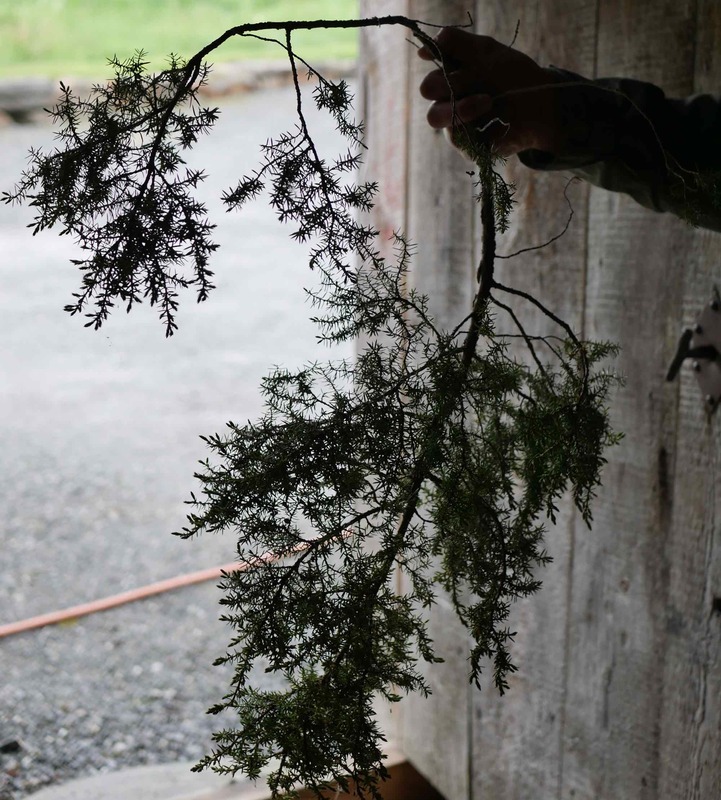 Stig said that the steeping makes the branches softer and removes sharper juniper flavors. Perhaps sanitizing the branches is one reason for steeping too, as Lars Garshol reckoned in his story Brewing Raw Ale in Hornindal. Setting up the lauter tun filter: first Stig placed a hollow roughly perforated wooden piece above the drain. This piece is a kind of coarse filter which keeps the drain open. Then he covered the bottom with juniper branches which had been first steeped in hot water. After setting up the lauter tun, Stig and Idar started to pour malts and juniper infusion into a mash tun, gradually in turns to ensure good mixing. The amount of juniper infusion used for mashing was not measured. Instead, these brewers used an old rule for mash thickness: there is enough water in the mash when the mash stirrer sticked into the mash falls slowly. The mash stirrer is falling down slowly. That means a proper mash thickness. As a sidenote, Stig told us another old rule which prevents diluting maltøl too much: at a proper mash thickness, mark the mash height into the mash stirrer. When collecting the wort, stick the mash stirrer into wort, and stop collecting the wort at the mark. Obviously this rule assumes that the wort is collected into the vessel that was used for mashing. After one hour of mashing, Stig scooped the mash into lauter tun. When all the mash was in the lauter tun, Idar poured two buckets of juniper infusion (around 20 liters) on the top of the mash without stirring. Stig recirculated wort until it was clear, and began collecting the wort into a 30 liter aluminum milk can. Around two liters of the first wort was taken for a kveik starter. The Lauter tun tap was set into a slow almost dripping flow, draining the wort at rate of around 30 l in an hour. The brewers tied the hops inside a mesh cloth, attached this hop sack into a mouth of the milk can, and let the wort flow slowly through the hop bag. Thus the hops were infused at no higher temperature than 70°C. After half an hour or so, Stig and Idar began to rinse the mash with juniper infusion. When the milk can was full of wort, Stig squeezed the juices from the hop sack into wort, and replaced a second can under the tap. The same hop sack was tied into the second can. The wort in the first can tasted slightly hoppy, and the four brewers agreed that the brew needs more hops. They attached another fresh hop sack into the mouth of the second can. The first can of wort was cooled right away to fermentation temperature of around 30°C and poured into fermenter. Stig used a self-made cooling device attached to a neck of can: a garden hose from which cold water runs down the outer surface of the can. 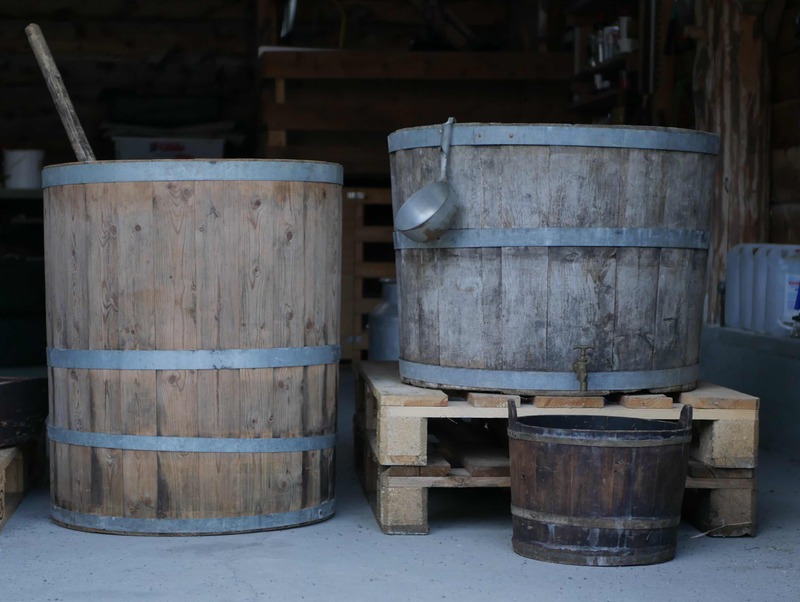 I was shown these handsome wooden vats, which were used for farmhouse brewing before the handier plastic. 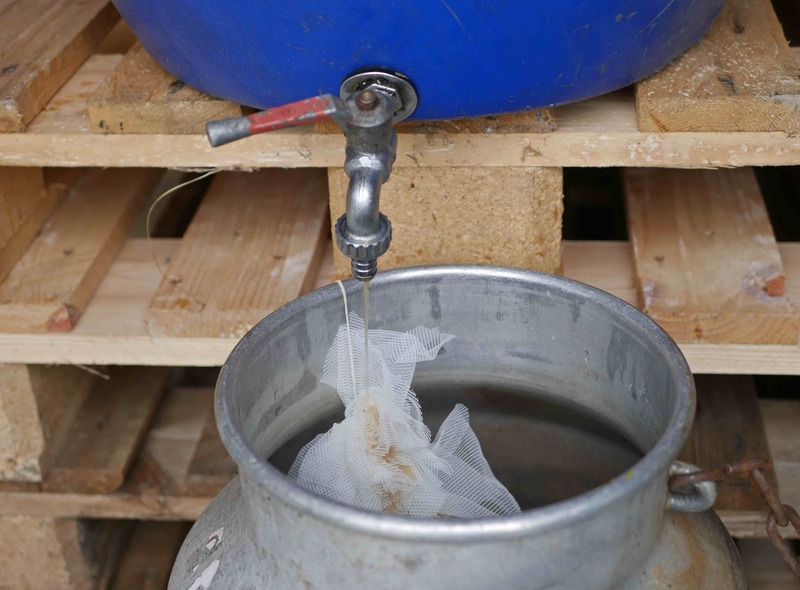 Even though the vats are now plastic, the process and the use of the vats is exactly the same. In the old days the mashing vat (left) was cleaned to be a fermenter after mash was scooped into lautering vat (right). These brewers used a heirloom kveik of unknown age. Each of these brewers collect their kveik independently, but they also share their yeast stock. Thus, this was a collective Hornindal yeast culture, and the brewers suspected that it would be difficult to keep this kind of culture alive alone. The brewers told me that this particular kveik works best at around 30°C. The brewers here in Horninal have experienced that it is best to add kveik not only from a previous batch, but from two or three separate batches. Stig had a dried kveik from Christmas 2016, Spring 2016 and summer 2014, and he added two of those into a starter. Stig also believes that it helps to add some dried kveik directly to fermenter, and he reserved small amount of flakes for that. When making a kveik starter Stig wanted to use a thermometer. When two liters of starter wort had been cooled to 32°C, Stig crumbled dried kveik flakes into the wort. A proper amount of yeast was a small handful. The starter was left to a warm place to keep it around 30°C, where it waited around three hours before pitching – at which time the starter was already active! We talked a lot about harvesting and using kveik, but that will be another story. On left Stig crumbles dried kveik flakes into a starter. The starter was pitched three hours later, when yeast showed activity, but the flakes had not been completely dissolved. When 70 liters of wort had been collected and cooled to 30°C, Stig pitched the kveik starter along with some dried flakes of kveik. I measured the gravity, which was 17.9 Plato (specific gravity of 1.074). Needless to say, these brewers do not measure gravity. The fermentation scheme was highly interesting. 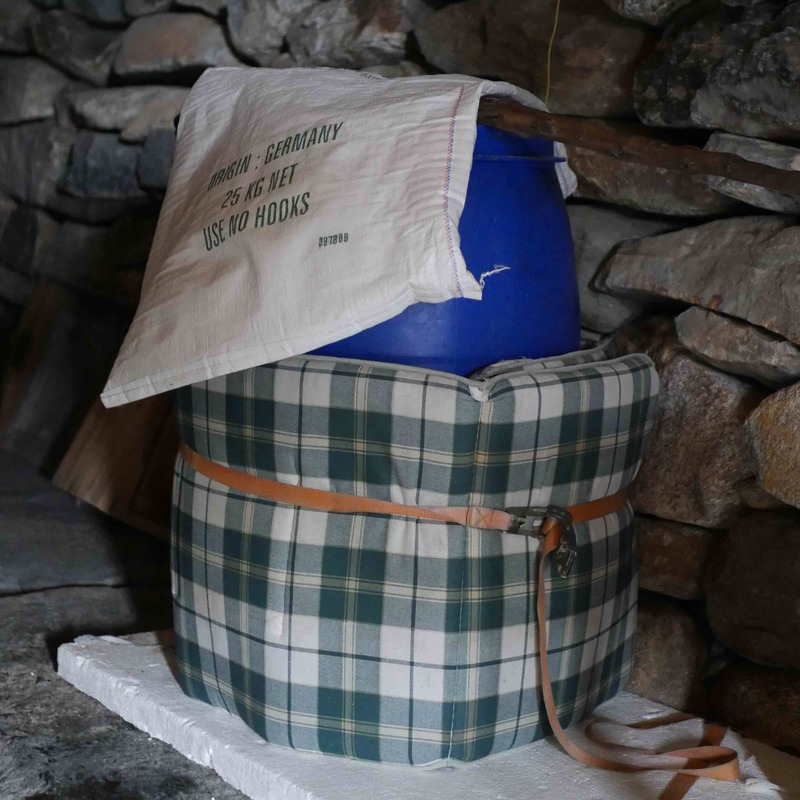 The fermenter was left in a cellar of around 14–15°C, insulated with a mattress and covered with a sack. The heat of fermentation will keep the temperature of the fermenter up in 30°C, and when fermentation ceases, fermenter slowly drops to cellar temperature. Fermenter in the cellar, waiting for the kveik to the take over. We left at this point and Stig described how things will proceed: The fermentation lasts usually two or three days, and right after fermention the ale is trasferred into another containers which can be glass bottles, plastic bottles or canisters, or stainless steel kegs. At this point kveik can be harvested either from the top or bottom. There are few tests to know if the ale has finished. For example, if after skimming some yeast from top the yeast gap closes again, then the ale is still fermenting. The beer will be then matured in the cold. It will be ready to drink in one week, but it is at its best in two or three weeks. The beer will remain in top condition for another tree weeks. During the visit I tasted several maltøls made by these four men and I got a good idea of the local style. The ales were in general sweetish, smooth and highly drinkable. Based on the brewing process, the alcohol content is perhaps around 7 %. The mellow flavor reminded me of some fine Lithuanian farmhouse ale kaimiškas. As a sahti this kind of ale would be untypical but not untraditional. In fact, Hornindal maltøl completely matches the definition of the Traditional Specialty Guaranteed appellation of sahti. The brews were hazy and the color ranged from yellow to pale amber. Most samples were fairly pale, and the one shown in the photo below was in the darker end of the range. The variability in color didn’t make a remarkable flavor difference however. The major character came from intriguing complex fruitiness featuring citrus fruits and red berries. Sweet taste of malt and cereals were clearly there, but they came second. The coniferous taste of juniper lingered smoothly in the background. The hop character was so low that I’m not sure what role they play in these ales. Perhaps the taste would be slightly different without them. Although this kveik is known to contain bacteria, I didn’t sense any sourness in the fresh ales. One several months old maltøl, which was brought just to educate me, tasted slightly tart, but not sour. It was not bad, though clearly inferior to the fresh ale. I returned home with a bag of dried kveik, and first exercise with that yeast will be brewing Stig’s maltøl. Let’s see how close I can get in my home brewery. A pint of Hornindal maltøl. Some ale were served carbonated from cornelius kegs and some came almost still from plastic soda bottles. This came out of keg, and hence the frothy head. 25th of August 2017: I added a comment that Hornindal maltøl would pass the TSG appellation of sahti. When you get the yeast going (maybe after you brew a couple of batches), will you be willing to send some my way dried? Domestically, within Finland. Cheers. Finns should definitely try this kind of house yeasts. After all, still in the 20th century we had a similar culture too. I will share kveik when I have learned good practices of using, harvesting and storing it. Kveik comes with a lot of folk wisdom and that should be passed on along with the yeast. I’m looking at making a braggot using Norwegian style brewing methods, however, I must use liquid or dry extract. I’ll add a bit of honey malt along with a few pounds of wildflower honey. I’m thinking of using Omega’s Hornindal Kveik yeast. As for juniper, I can get juniper berries in the spice section of the store, but how do you treat the juniper branch for the boil? Do you de-bark it or leave the bark on? Nobody in the farmhouse circles seem to de-bark juniper branches. Brewers just cut the branches and use them as such. In my mind juniper berries are an acceptable substitute to branches although the taste difference is noticeable. With branches it is the needles and wood that mostly contribute to flavour.